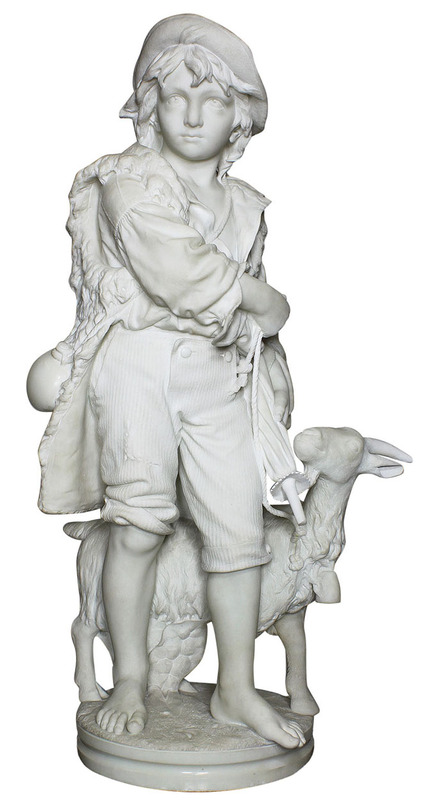 A Very Finely Carved Italian 19th Century Carrara Marble Figure of A Young Shepherd Boy with his goat, by John Udny (Italian, 1850-1927). 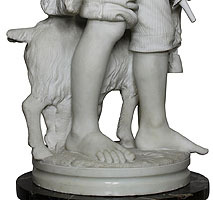 The barefoot young boy standing next his goat, holding on to it with a rope, wearing short pants, a sheepskin vest and a hat, carrying a closed umbrella and a water canteen on his side. The intricate detail of each and very part of this sculpture makes it one of Udny's best executed works. 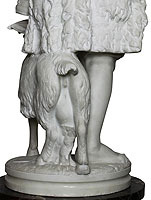 The sculpture is raised on a Levanto Rouge revolving pedestal stand. 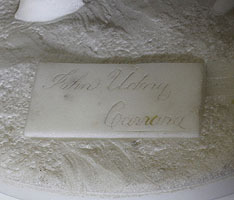 Signed: John Udny, Carrara. 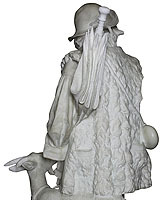 The sculpture is circa: Carrara, 1880. Giovanni (John) Udny was born in 1850, in Livorno Italy and died in Genoa, Italy in 1927. He is the eldest son of Roberto Udny and Enrichetta Achiardi. The sculptor, John Udny, is a descendant of John Udny the British Vice Consul of Livorno, Italy who was born in Scotland about 1755 and died in Fiume, now Rejka, Croatia in 1802. John learnt his genius carving with marble from his uncle Giovanni who was a marble merchant. 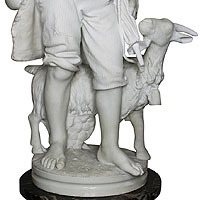 A Very Finely Carved Italian 19th Century Carrara Marble Figure of A Young Shepherd Boy with his goat, by John Udny (Italian, 1850-1927). 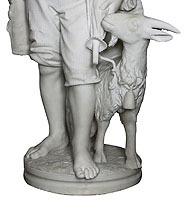 The barefoot young boy standing next his goat, holding on to it with a rope, wearing short pants, a sheepskin vest and a hat, carrying a closed umbrella and a water canteen on his side. The intricate detail of each and very part of this sculpture makes it one of Udny's best executed works. 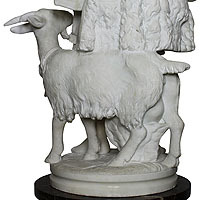 The sculpture is raised on a Levanto Rouge revolving pedestal stand. Signed: John Udny, Carrara. 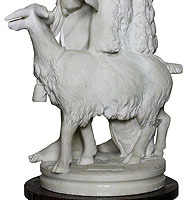 The sculpture is circa: Carrara, 1880. Giovanni (John) Udny was born in 1850, in Livorno Italy and died in Genoa, Italy in 1927. He is the eldest son of Roberto Udny and Enrichetta Achiardi. The sculptor, John Udny, is a descendant of John Udny the British Vice Consul of Livorno, Italy who was born in Scotland about 1755 and died in Fiume, now Rejka, Croatia in 1802. John learnt his genius carving with marble from his uncle Giovanni who was a marble merchant. Condition: A truly beautiful and very charming sculpture. There are professional restorations to the umbrella handle, ribs and finial. Also to boy's left toes, ram horn and rope. The restored condition is very good. The later pedestal swivels and rotates easily. Wear consistent with age and use. Minor losses. Minor fading.